The perfect complement to our updated “Modern-meets-Classic” hotel rooms are the upgraded and highly functional meeting rooms and outdoor event space. 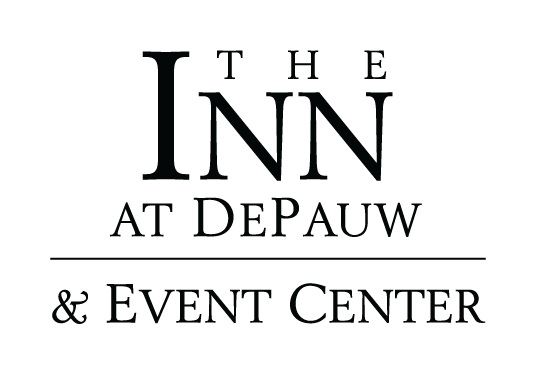 The Inn at DePauw & Event Center is designed for retreats, meetings, conferences, corporate seminars and business events where quality of facilities and services is a requirement. Accommodating up to 300 guests in an array of floor plans and seating arrangements, our meeting rooms adhere to the highest standards in the meetings and events industry. ​To simplify budgeting and planning and reduce your cost, our Conference Package (CMP) gives meeting planners a "one stop" option that fulfills every need, from meeting room technology, to conference dining and overnight hotel accommodations. For events not requiring an overnight stay, our Day Meeting Package (DMP) includes all that is required to produce a successful full-day or half-day training program, board meeting or special business event. Conference dining is available in 2 West Bistro for breakfast, lunch and dinner, and The Fluttering Duck for after-hours snacks and entertainment. The culinary staff at The Inn at DePauw & Event Center takes special pride in the fact that they work with local vendors to provide the freshest of ingredients to our guests. Offerings for those guests with dietary restrictions are available and can be planned in advance. Delicious snacks and beverages are available and replenished all day during meeting breaks. The Inn’s staff plans for a large variety of gourmet choices, all of which have been specifically chosen to help keep attendees alert and invigorated so that productivity of the event is maximized. ​Retreats at the Inn can be as structured or unstructured as your group's goals require. The Inn gladly accommodates crafters and hobbyists as well as all-inclusive business meetings. Plan for catered meals or allow your guests to dine on their own at the Inn's restaurants. Crafters and artisans often utilize the Inn's flexible meeting space for intensive weekend crafting retreats, while family groups plan relaxed reunions using public areas of the Inn as a hub for reunion activities. Outdoor sports hobbyists provide education classes in the Inn's meeting rooms, and then utilize nearby nature parks and sports complexes to practice what has been taught. Corporate visitors developing a unified company culture spend time in small sessions with a facilitator punctuated by golf at a local club or other team building activities.